I’ve barely talked at all about LIVESTRONG® Day; perhaps I’m finding it a little daunting. It was a humbling yet inspiring experience. Of approximately 200 delegates I was one of only a handful who had not personally survived cancer. And many of the survivors were oncologists and cancer survivors or the heads of advocacy organizations and cancer survivors – you get the picture. It was also a whirlwind. Since I missed my morning flight on May 14th the only flight I could get left at 11:50 p.m. and had a stopover in Atlanta. I arrived at the hotel just as the training had started. Lance (I can call him that now – once you’re part of the “team” it’s your privilege*) spoke at the training – rushing in to talk and then straight out as he was between meetings and TV interviews the entire time he was in D.C. I did get several cell phone videos of him, one in which he mistakes one of the delegates for Bill Cosby. That was most funny, as you’ll hear if I ever post the video because I cackle right into the speaker the entire time (NOTE TO KATE: When taking videos, remember that you’re RIGHT NEXT TO THE LIL’ SPEAKER). It was a whirlwind for everyone from there. There was a reception that night at ESPN Sports, most of which I missed, because I’d read my email, which included Kari’s obituary. I went to tell some other delegates that I’d like to know the way to the reception, in case I decided to come later, but that I wasn’t going to go with them. I had scarcely walked out of my room and to the elevators, when another delegate looked at my face and asked me what was wrong. I broke down, of course, and she sent her husband and son, who were visiting downstairs, and she sat with me on a couch to console me. To console ME. This incredible woman is a breast cancer survivor (diagnosed two weeks apart from her sister). I expressed to her that sometimes I felt so horrible because I just felt like everyone was sick and dying all about me; I sometimes feel like a bizarre epicenter of illness and death (even though intellectually I know that’s ridiculous). And then I conveyed how guilty that made me feel; I was never the dying one. This woman, with short, short-cropped hair, probably indicating that she’d had a round of chemo not all that long ago, said that sometimes she thought it was harder to be on the outside. Bless her. Needless to say, I felt unworthy in the face of these amazing survivors, yet not a single person made me feel like I shouldn’t be there or that I didn’t have something to offer. We were all there for one purpose, and they cared more about how hard we could work than which person had survived more cancer recurrences. The next day we were to take the requests of the Lance Armstrong Foundation to the legislators for our specific states. A delegate from Virginia rescued me as I was running to the Metro and put me in the cab with him and insisted on paying the fare because “he worked with another group for whom he could write if off.” And as he had extra time, he took me not only into the building for the members of the House, but to the very office where my first meeting was to be. Kermit, the other delegate from Utah guided me everywhere else all day (as he’s been on the circuit speaking with the legislators for other advocacy groups with which he works). He’s a prostate cancer survivor, and in the second or third email I ever exchanged with him provided amazing research links. Hope for my Father. Hope that I didn’t think existed. The meetings were productive (I hope – I’ll talk more about that later). There was an unfortunate situation that I noticed too late to fix it; I had NO antiperspirant/deodorant with me (there was a noble effort of to make my suitcases light enough as I was almost out the door – Shirleen and my Mom generously helped me and gracefully ignored the rather ungenerous, hysterical comments I made while they assisted me. Don’t worry, they’ve already obtained my most sincere apologies and they are getting presents, too). It seems that the antiperspirant/deodorant did not survive the cut (and I did not notice in time to do anything about it). At least my luggage was not over the weight limit. I suppose I mention this in case you ever run into a Utah legislator who remembers LIVESTRONG® Day 2007 and happens to recall the distinguished older gentleman who said just enough and the younger delegate who smelled…funny…and had difficulty shutting her trap. All day I thought about and talked about those I loved for whom I wanted freedom from cancer to be a reality as well as those who had lost their battles with this disease – this insidious killer that takes the lives of 560,000 people a year. The worst part is that about a third of those deaths could be prevented with equitable healthcare and early screening. I only had to remember that fact and I wouldn’t have traded places with anyone in the world so that I could be part of the effort to change those statistics. That day, a bill was introduced at this press conference: The Cancer Screening, Treatment and Survivorship Act of 2007, a bi-partisan, bicameral bill sponsored by Senator Tom Harkin (D-IA), Representative Jan Schakowsky (D-IL)), Senator Olympia Snowe (R-ME) and Representative Sue Myrick (R-NC). This bill was written by the the Lance Armstrong Foundation, but they did it in collaboration with a myriad of other important cancer organizations, such as the American Cancer Society, The Leukemia & Lymphoma Society, href=”http://cms.komen.org/komen/index.htm”>Susan G. Komen For The Cure, etc., etc., etc. After the press conference, this bill was introduced in the House and the Senate. 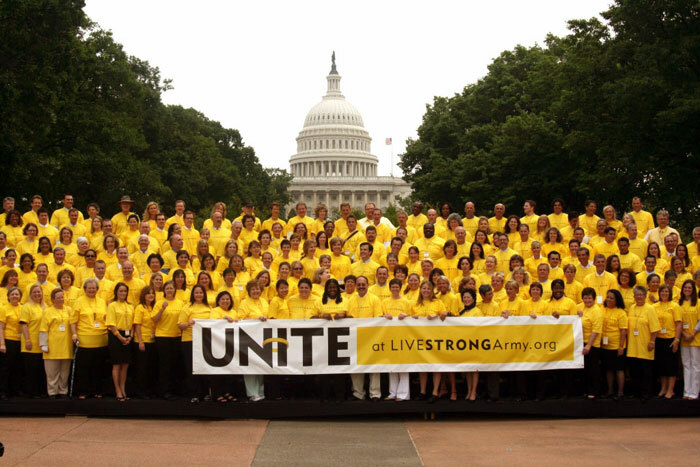 One of our jobs as LIVESTRONG® Day Delegates was to visit our respective state Senators and Representatives and ask them to support this legislation. We requested particular funding increases (entailed in the Labor/Health and Human Services Appropriations Bill); we requested a 6.7% increase for important research at the National Institutes of Health (NIH), 6.7% for the National Cancer Institute (NCI) and a $136.6 million dollar increase for critical cancer programs at the Centers for Disease Control and Prevention (CDC). Blatant requests for funding tend to make legislators frown. Imagine that. The Lance Armstrong Foundation for accepting my application and giving me the incredible opportunity to be a part of this amazing experience. Shirleen and my Mom for making sure I ACTUALLY GOT THERE; they performed miracles. Under duress. Ashley – for giving me that very first LIVESTRONG® wristband. Mic and Henrike for motivating me to become more and more invested in the Lance Armstrong Foundation. All those individuals who have inspired me with the bravery, strength and positive attitudes in their battles against cancer. You’ve all been on my mind a lot right now, both the survivors and those who lost their battle against cancer. I did this in your honour; it is my sincere hope that we’ll make a difference. All those who supported LIVESTRONG® Community Activities – even if it was simply wearing a wristband or LIVESTRONG® socks or shirt or hat – it spreads the word. Special thanks to Emma, who distributed wristbands to her entire class. That practically qualifies as an “official” LIVESTRONG® Day activity; there were approximately 230 LIVESTRONG® Day activities on May 16, 2007 held around the country. Everyone I’ve forgotten. In the tradition of the Oscars, I’ll use that catch-all and hope it suffices. Please send a message to your State Senators and Congress people telling them how important it is to support the The Cancer Screening, Treatment and Survivorship Act of 2007. If you follow this link, it helps you send a message to your specific legislators with suggested text for an email letter that you can build upon or send it as is. The three main focuses of this bill, in a nutshell are 1) Expanding Access to What Works, 2) Ensuring Access to Treatment and Appropriate Survivorship Care and 3) Accelerating Discovery. Please contact me if you’d like to know more. Also, you can visit the Library of Congress Thomas Locator (enter bill number S1415 for the Senate and H2353 for the House) and read the text of the bill and see where this legislation is in the process. Now Utah folks, I should tell you that almost ALL the legislators with whom we met indicated that they were interested in co-sponsoring this bill. NONE of them have done this do far. Mind you, one of the Senators is on the Senate Finance Committee (where the Senate version is now) and one Representative is on the Energy & Commerce Committee (where the House version of the bill is currently). I’m afraid that I do not know whether or not this precludes them from co-sponsoring the bill; nonetheless, I don’t believe it hurts to send a message saying that, as their constituent, you’d like their support). I should also tell Utah folks that despite the nicknames that I’ve had for Senator Orrin Hatch over the years (they aren’t THAT bad), he instigated a bi-partisan “Dear Colleague” letter that asks fellow senators to support the 6.7% increase for the NIH in the Fiscal Year 2008. There are forty-eight signatures on this letter. Ironically, this was a letter that we discussed extensively in our advocacy training, though the LAF was under the impression that it was the “Kennedy” letter and asked us to find out if our Senators had signed the document. I have to say – I was proud to be able to provide the Foundation with a copy of the letter with all the signatures about which they’d wondered. 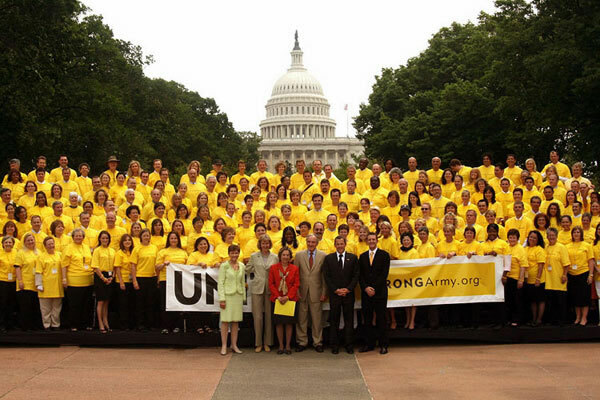 Please join the LIVESTRONG® Army. It doesn’t entail any large commitment; you’ll receive information about the status of research, legislation and survivorship issues. If you do join, please let me know (just leave a comment with this entry, if you’d like). International readers (that makes me sound vaguely urbane, but I see that people are visiting from other countries on my “Minty” map – WELCOME ALL – and it must be for some reason), I believe you are free to join the LIVESTRONG® Army, too. Please consider it!. Lance Armstrong Foundation (and very soon PRIZES will be involved). And PLEASE – don’t worry if you can only make a tiny donation; every little bit counts. I think supporting the team also makes an important statement. I strongly believe that cancer should be a National Priority; it’s the NUMBER ONE killer in this country for individuals under the age of eighty-five. But also, I think cancer must be an INTERNATIONAL PRIORITY; it is a world killer to whom no one is immune. *I should confess right here: No, I did not ACTUALLY meet Lance Armstrong. I shared the same air with him three or four times, but I barely missed every opportunity in which to shake his hand and say… hmm… and say… well, probably too much with a percentage of it being completely unintelligible. Another times, I hope. I’m so proud of you for being part of the Livestrong Family. Don’t sell yourself short, you’re doing an amazing job, getting attention and spreading the word about the LAF and cancer fundraising in general! It doesn’t matter if you’re a cancer survivor or not- you’re making a huge difference by getting involved! Did you ever consider to join our team yourself? I mean, you don’t actually have to attend the Challenge (I think I remember you once told me you didn’t plann on going to be in Austin this year). That would probably start a better team building process- I tried to get people from Germany involved in the team, however, due to the massive doping scandal in Europe, people get rather nasty whenever I mention the name Lance Armstrong. I can give them all of my good arguments, like the fact that the LAF does support European scientists, too, and the fact that the money does not go to Lance Armstrong personally, but up to this point there’s really no success. Either way, I’m glad I got to know you- though only via the Internet- you’re really inspiring and you always make me laugh through your blog- and at times like these with my best friend dead at 30 due to terminal breast cancer I can use all the cheering up I can get. Hope your doing good! Just stay the way you are and keep up the good work! I am glad that your cause is keeping you busy and focussed. I am sad that I seem to have been left by the wayside. I know I never sent you the final version of the RoseMary story. I did, however, send Mic some money — not that I’ve heard from him since then. Why do I feel neglected???? !